Last month Delaney stepped aside from the role just days before he was due to appear before a parliamentary committee to be questioned over a €100,000 loan he provided to his federation two years ago. Instead he took taken on a new position as executive vice-president with responsibility for all FIFA and UEFA matters. Delaney, a UEFA executive committee member, has been at the centre of public scrutiny since a Sunday newspaper broke the story that he had loaned €100,000 of his own money to the federation in 2017. News of the transaction emerged after he failed in an attempt to obtain an injunction preventing publication of the story and he subsequently admitted he had made the loan to help the FAI through a “cash-flow” problem. 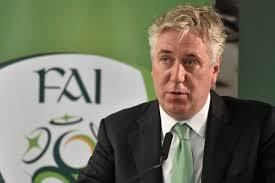 Delaney and other FAI officials were to appear before an Irish parliamentary committee hearing today but in advance of that, Sport Ireland, which is responsible for the administration of taxpayers’ money to sporting bodies, announced its suspension of the hugely important €2.7 million annual funding as punishment for breaching loan rules. FAI president Donal Conway bemoaned the ruling saying the money was “crucial to the development of an inclusive approach to football in Ireland”.